Video Deposition Equipment: What’s All That Stuff For? When wheeling all my video equipment into a job, it is not uncommon for someone to say something along the lines of “and I thought I had a lot of stuff” or “are you moving in?” And to be fair, we do truck along with a lot of gear for video depositions, usually much more than can easily be carried in one load without a small handcart (stairs are our enemy). So, what is all that equipment? Is it all necessary? What’s the difference between our stuff and setting a camcorder on the table and pressing the red button? Well let me walk you through it! Our camera is at the same time the most important and least important part of our kits. 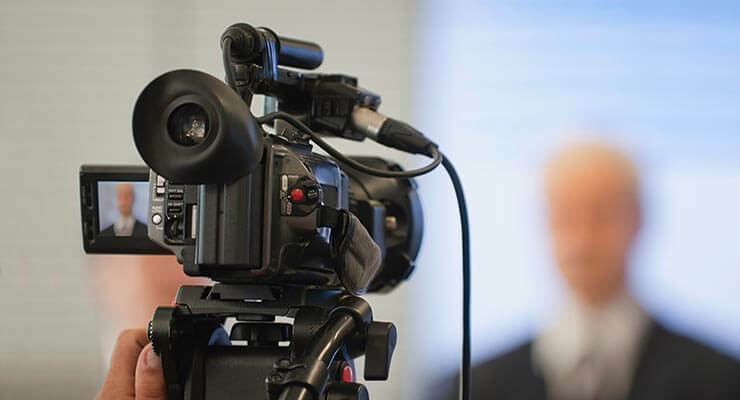 Obviously, you can’t film a video deposition without a video camera and they need to record at a good quality while having features like time stamps, but after those basic requirements, deposition cameras are fairly interchangeable. Sure, you can get a camera today that records in 4k, 3D or slow motion if you like, but when it comes time to play your deposition at trial, it will be downscaled to a standard definition DVD. I would personally record and backup everything in high definition, but that would make each DVD I send to our clients 20-30 min long instead of the 2 hours standard def gives us. If the camera is not the most important part of our equipment, our microphones certainly are. Managing audio can be a tricky task even with professional equipment and is a nightmare without it. The cameras themselves come with a built in “omni” microphone that supposedly covers all directions, but any decent videographer immediately turns this off and uses a lavalier mic for each speaker and possibly a high-end table mic to cover the rest of the room. The microphones we use keep a fairly narrow field so it only picks up audio the way it’s pointing. They are also shielded against other kinds of interference. These two factors reduce the ambient noise that is picked up as well as any errant interference from cell phone signals. A standard camera mic tends to pick up the noisy air conditioner the same amount as the witness, plus there is no way to adjust the input for each speaker. And even in today’s wireless age, the best audio still comes from wired microphones. I tried to use wireless mics a while back and I found that whenever I got up into a tall building, I was picking up radio signals. Most of our clients do not want a country soundtrack to their depositions. Mixers come in all different shapes and sizes but their function always the same: to blend four or more audio sources into one audible stream. With multiple mics and a mixer, we can monitor and adjust each speaker’s volume, that way the soft spoken elderly lady comes across as loud and clear as a boisterous attorney. This also allows us to turn down the audio when someone is either coughing, talking to a colleague or knocking their mic off in a flurry of demonstrative hand waving. If there is one sure thing in the modern age, it’s that technology fails. No matter how advanced your equipment is, at some point something is going to break. 8mm reels melt, VHS tapes get twisted, DVDs skip and scratch, and hard drives become corrupted. Eventually something we are recording on will either stop working or not record the way it should have. To combat this, we use two different recording devices for video and a separate device to record the audio. We also keep our backups on two different types of media to ensure that if one device goes down we still have a copy. And then if something catastrophic happens, I record audio on a battery backed up device to ensure that at the very least I have a good recording of the audio from the deposition. A laptop can provide a variety of uses for videographers. Some equipment sets use a laptop as another recording device, making it easier to transfer the file after a deposition. Also in some cases, clients have requested that we stream the feed from our video camera out to a co-counsel or someone else that is not present at the actual location, and our laptops allow us to facilitate these requests in addition to giving us a way to log the times and appearances without submitting anyone to our somewhat questionable handwriting. Of all the equipment I carry with me, my backdrop gets the most jokes and comments. And I do understand why. It’s easy when you see the blue-ish disc hanging up to flashback to grade school yearbook photos. But while I don’t have any umbrella flashes, the backdrop is helpful for a variety of reasons. From a technical standpoint, it helps balance the light on the shot, making the witness stand out much better on the final product. A backdrop also helps hide any distracting paintings or windows that many conference rooms tend to have. Mix all this stuff together, add about a half mile of wiring, and you have a working set of equipment for videography. And while it can be a pain to lug it all around and set up /break down all of it each day, every last piece is required to ensure we do our job correctly and produce a professional looking video deposition. Have you downloaded our comprehensive report about how video can be a great tool for attorneys in the litigation process called “Lawyer’s Guide to Legal Video: Why, What & How”? If not, access it by going to: http://www.mobleyreporting.com/lawyers-guide-to-video/. Steve Troncone has worked in the court reporting field for over 12 years in multiple areas including videography, production, technology support, and trial presentations. He has been working with Mike Mobley Reporting as a legal videographer and office support team member since May 2016.